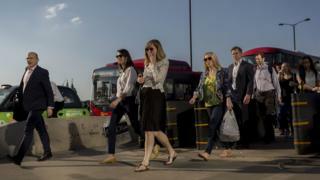 The proportion of households in the UK where no-one is working is at its lowest point for over 20 years, the Office for National Statistics says. The figures show 14.3% of households containing working-age adults are “workless” – down 0.2% compared with the same point last year. Fewer children were living in families where no-one was currently working. But more children were living in households where no-one had ever worked – up by 32,000 to 204,000. The employment figures show a picture of rising levels of work in the 21 million households with people aged between 16 and 64. There are fewer workless families now than at any point in a data series going back to 1996. In the late 1990s, about 20% of households had no adults working, but that has fallen to about 14%, representing about three million household. In about 12 million households, all the adults had jobs – with 7.5 million children living in homes where everyone was working. The proportion of children living in workless households is down to about 10%, about half the levels of the late 1990s. The numbers of lone parents in work have remained broadly constant for the past decade, says the ONS, with a slight rise reported in these latest figures. The figures show that people with dependent children are more likely to be in work than adults without dependent children. Almost 93% of men and over 74% of women with dependent children are working – including both full-time and part-time jobs. Work and Pensions Secretary Esther McVey said: “One of the best ways to tackle poverty and give children a better chance in life is to have a working adult in the house. “It gives them a role model to learn from and brings financial security to the home. “Getting a job means more than just a wage, it’s a way out of poverty and welfare dependency,” she said. But poverty campaigners have highlighted the importance of the quality as well as quantity of jobs – saying the changing labour market can mean families can be stuck in low-paid or insecure jobs. They have warned that most children living in poverty are now in families where at least one parent is working.